When I think of animal print decor, safari images instantly come to mind. Safari dinnerware may fit the kitchen decorating theme, but really, the options are endless. There are many animals, wild and domestic, that could bring a new look to your kitchen and dining room. Many of the top of the line dinnerware manufacturers carry animal print dinnerware. 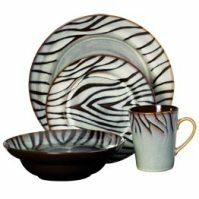 They range from melamine dinnerware sets to porcelain and fine china dinnerware sets, and from zebra prints to boa snakeskin. These dinnerware sets can bring the décor to life. American Atelier is the distributor of the Boa Dinnerware Set . It comes in red and in white. I find it kind of creepy, but with complementary décor I'm sure it would look nice. It is definitely different and is sure to liven up the conversation in the kitchen or at the dining table. I was suprised to see that Lenox produces fine bone china in a Zebra pattern . It is licensed by Scalamandre, the designer, who added some flair to the Lenox line. This pattern is very unique. There are coordinating serving bowls, platters and accent plates that are sold seperately from the five-piece place setting. The Kenya Dinnerware Set by Tabletops Unlimited brings animal print patterns to your tabletop. This dinnerware set is made of stoneware so it is dishwasher and microwave safe and ideal for everyday use or for dinner parties. The Vietri Safari patterns feature several animal prints on dinnerware, wall plates, bowls, and glassware. Zebra, leopard, giraffe, and tiger animal print decor can be found in this line by an American company who specializes in bringing Italian dinnerware to American tables. 222 Fifth has produced many animal print patterns including Zebra, Leopard and Sunset Safari. These are square dinnerware patterns of fine china. They are very nice. My favorite animal print decor on dinnerware is the Nova Studio Jungle Beat pattern. It mixes tiger and leopard print for an awesome effect. If I were decorating in animal prints, this would be my choice. The pattern has been discontinued, but it is possible to create a full set through replacement companies. Back in the 80s, cow prints and cow dinnerware were popular. I don't know of any cow patterns that are currently being produced, but there are some retired patterns that you might run across at estate sales, internet auctions, and I'm sure that the replacement companies have some. If cows are your choice, you can easily make a cow animal print pattern on ceramicware if you enjoy crafts. There are a lot of selections when it comes to animal print decor and there are dinnerware lines that complement it.